Caleb Truax never planned on becoming a boxer, and only got into the sport after fighting in a Toughman Contest during college. Despite limited amateur experience, the Minnesota native has established himself as a contender in the 168-pound division. Truax was an athlete long before he became a boxer. Growing up in a single-mother household along with his twin sister and a younger brother, Truax was a baseball and football star in high school in his native Osseo, Minnesota. He then played football at Virginia State University for one year before a knee injury ended his gridiron career. He returned home in 2003 to attend the University of Minnesota, and it was there at the age of 19 that Truax entered a local Toughman Contest. He lost his first fight, but soon became consumed by boxing—altering his diet and training relentlessly as he pursued an amateur career. Caleb Truax lands a right uppercut during his win over Matt Vanda on January 19, 2013. In 2006, Truax earned his degree in sociology from the University of Minnesota with minors in political science and African-American studies. He also excelled in the ring that year, winning regional, Upper Midwest Golden Gloves and USA Boxing state championships. Truax had his sights set on the 2008 Olympics, but after it was discovered that he had fought in the Toughman Contest, he lost his amateur status although he received no compensation for his participation. He turned pro soon after, finishing his amateur career with a record of 21-8. Caleb Truax tags Don George with a right hand during their fight in Minneapolis on June 21, 2013. An avid fisherman, Truax made his professional debut at the Target Center in Minneapolis on April 6, 2007, scoring a second-round technical knockout of Ray Walker. Fighting almost entirely in his home state, Truax won his first 14 fights, including nine stoppages, and was named Boxing Digest’s Prospect of the Month in April 2009, employing a cerebral, methodical approach to break down his opponents. A draw against Phil Williams in April 2010 put the first tarnish on the undefeated “Golden,” but Truax proceeded to defeat Williams in a February 2011 rematch in Hinckley, Minnesota, winning a 10-round majority decision. After defeating Andy Kolle in May, Truax took on former 160-pound world champion Jermain Taylor in Biloxi, Mississippi, in April 2012. Truax gained a ninth-round knockdown, but Taylor won a 10-round unanimous decision. Caleb Truax delivers a right hand during his win over Cerresso Fort in Minneapolis on September 21, 2013. Truax rebounded five months later with a first-round KO of Mickey Scarborough in Saint Paul, Minnesota. He followed that up with a fourth-round TKO of Michael Walker in November 2012. Truax continued to establish himself as a rising contender in 2013 with three victories in Minneapolis. He won a 10-round unanimous decision over Matt Vanda in January, gained a sixth-round TKO of Don George on ESPN’s Friday Night Fights in June as a heavy underdog and then defeated Cerresso Fort in September with a fourth-round TKO. Truax opened 2014 with a 10-round draw against Ossie Duran in January, but proceeded to win a 10-round unanimous decision over Derek Ennis in July before closing the year with an eighth-round TKO of Scott Sigmon in November. Caleb Truax lands a left hand during his loss to Daniel Jacobs in Chicago on April 24, 2015. Truax got his first shot at a world title when he faced 160-pound champion Daniel Jacobs in Chicago on April 24, 2015, in a bout that aired on Spike TV. 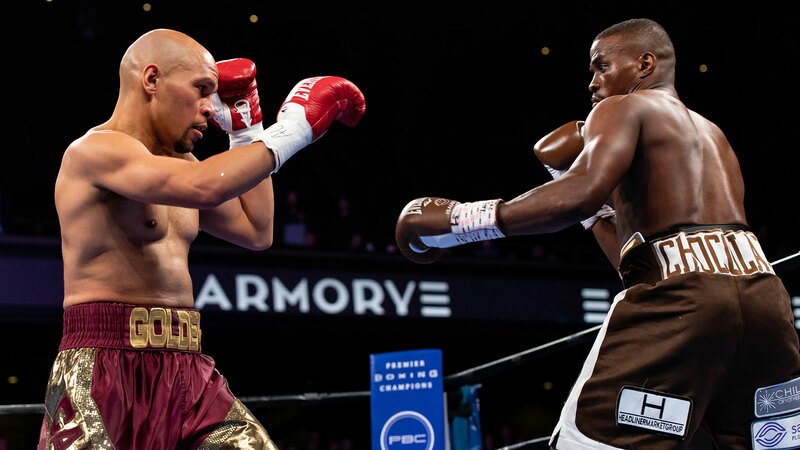 The boxers engaged in a defensive battle in which few big shots landed during the first half of the fight, but the action picked up in the second half as Truax fell behind on all three judges' scorecards. Truax had difficulty penetrating Jacobs' defense most of the fight, but was able to outbox the champion in some of the later rounds. Jacobs wore down Truax, though, and scored a knockdown in the 12th round before finishing off Truax moments later. It was the first time in Truax's career he lost via knockout.